Space Agent · Drive Bookings to the Channel of your Choice. Drive Bookings to the Channel of your Choice. Find future guests before they start searching. Automatically build and run ads on Facebook, Twitter, Pinterest and Instagram. Uses machine learning to hypertarget ads to the people most interested in visiting your location. Send guests to the channel of your choice. Guests can book directly, increasing your margins and building a direct relationship for future stays. Space Agent advertises to potential guests on their social networks, rather than waiting for them to find you. This grows your social presence, increasing the impact of any posting you do in the future. Follow your ad's performance in real-time using our dashboard. You'll get a weekly report showing views, clicks and likes, plus how many people shared your ad with their friends and insights about them. Space Agent was built for property managers to make finding guests easy and effective. 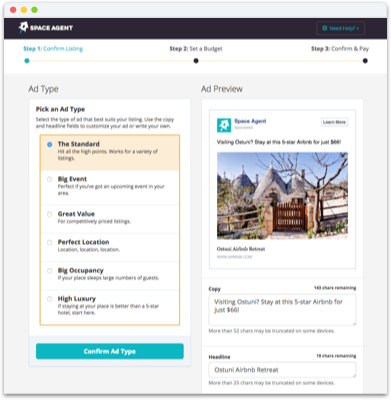 Space Agent does everything for you, including: building your ad, optimizing your targeting, managing running ads and sends weekly reports. Our patented machine learning technology shows ads to the people most interested in traveling to your location. We deliver social marketing expertise in just a few clicks. Power your in-house team and get big agency results without the cost. Our ads have helped deliver bookings in over 35 countries across the globe. Plans for individuals, property managers, and hotels. Best for up to 5 ads. Best for up to 20 ads. Best for up to 50 ads. All plans renew monthly. You can cancel at any time. For pricing, plans and more, fill out the form below and we’ll respond within one business day. What Property Management Systems (PMS) do you use?